Amazing, never knew they existed till i happened upon your pics! thankyou! Very interesting! 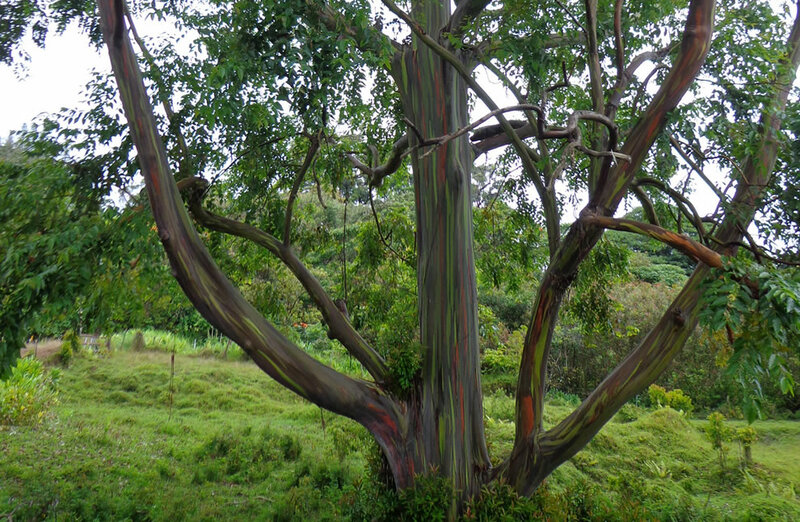 While in the Army, stationed at Schofield Barricks, I spent three years, many hours in the field during training exercises in the mountains, including jungle training and never saw any of these colorful trees. My time in Hawaii was 54 years ago. Wow! I never heard of this tree before. It’s absolutely beautiful. 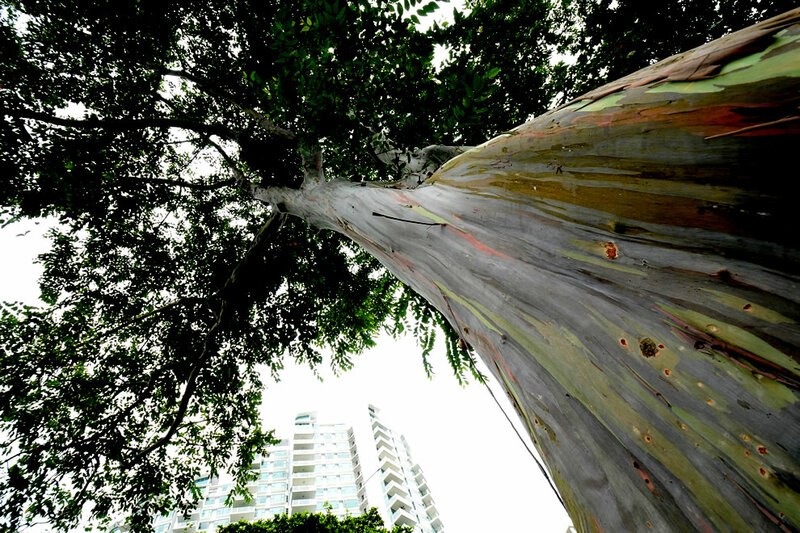 Thank you for these pictures of this truly remarkable tree. …..it just proves that God is an abstract Artist!!! Fascinating and beautiful. Truly God is an abstract artist. Then they say that God doesn’t exist. This just didn’t happen it was engineered by the GREAT CREATOR,Jehovah God, the GREAT I AM. Yes indeed our God Jehovah is awesome in everything he does. Please, enough with this God stuff. Evolution is a process that’s been proven. There are many Gods. Also, given the richness and overly yellow color of the greens foliage and flowers, these pictures are quite photoshopped. Indeed. But the one true God is called Allah, not Jehova. All praise to the omnipotent, loving, compassionate creator and artist – Allah!! THESE PICTURES MAKE ME PROUD TO KNOW THAT JEHOVAH IS A GOD OF LOVE. I FELT LOVED WHEN I SAW THESE BEAUTIFUL CREATIONS. You are so right!!!!! take a look at the Rainbow mountains (google) it I know u will love it. Even excellent artists can be cruel and sadistic! Dear ben, I will be praying for you that God will soften your heart to the TRUTH. Pray for yourselves, Ben is fine the way he is and so is the world. Of course God created everything, but why does every place I look have to see your religious beliefs crammed down everyone elses throats. But when we come to your door, you don’t open it. But you ring my doorbell off the wall to make sure your word is heard. Sick stuff. So you are saying you believe in God but you hate his worshippers? Can you imagine if these were in the USA during the 60’s? We might have never invented computers! I don’t think you did. I think you’ll find they were invented in England. UNIQUE AMAZING WE HAVE FIXED NOTION ABOUT TREE ,BARK AND BRANCHES BUT THIS HAS CHANGED THAT MULTI COLOR EXIST. This is wonderful and we have E.Deglupta in SriLanka but does not attractive like this. May be the low temperature Eg:20-24c. Fabulous…can you imagine if these beauties grew anywhere…..what a beautiful world….. I grew up in Lakewood, Ca and I don’t ever remember these beautiful tree. 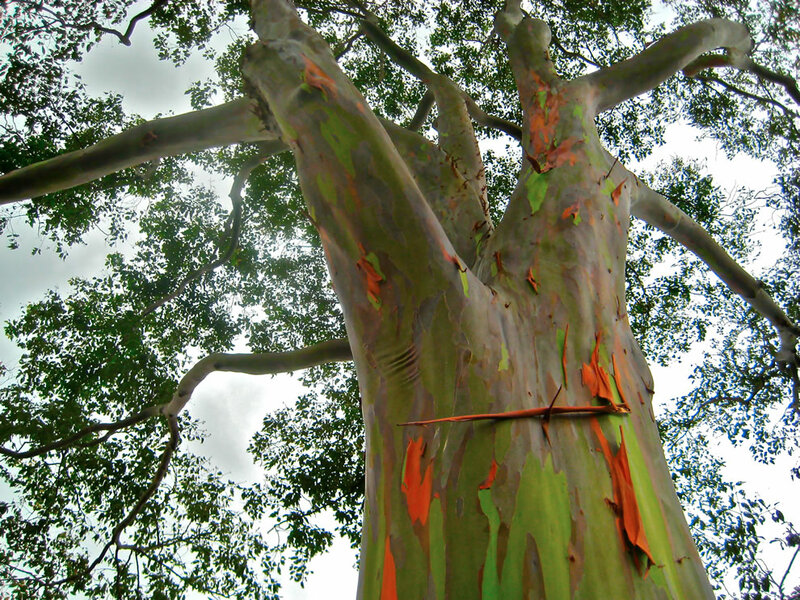 The most common California Eucalyptus variety (“Blue Gum”) one of many which many are familiar, are not native to California, but to Australia. 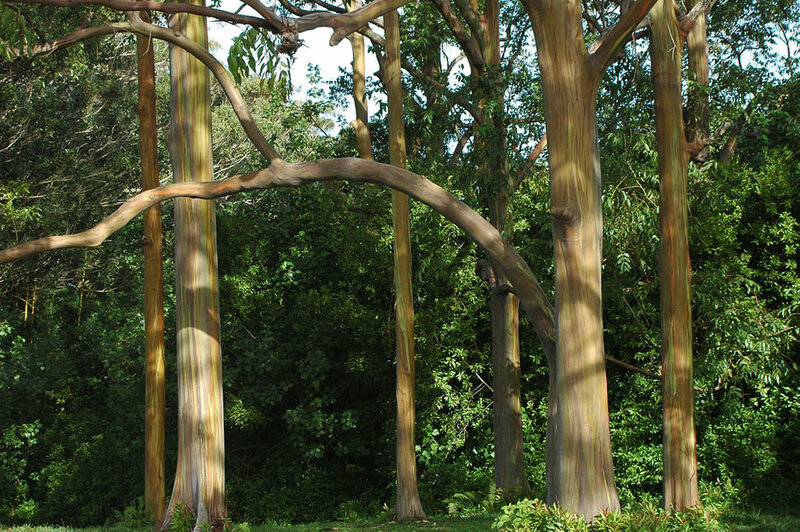 There are about 600 species of these trees, mostly in frost-free climates in the world. 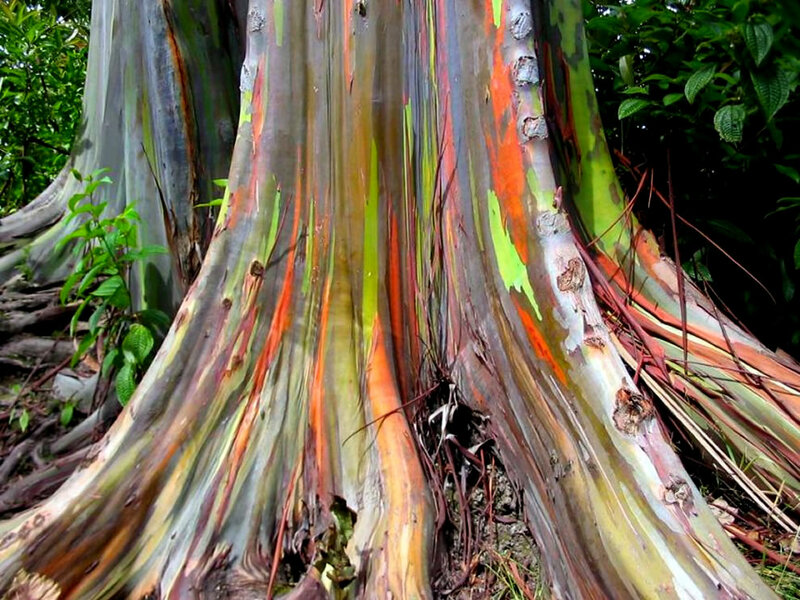 The Rainbow Eucalyptus–with a particularly beautiful bark– will not grow in California because the climate is way too dry for this type. You are probably mistaking it for other species which thrive in the more arid areas. They were imported by men interested in botanical varieties of trees in the mid-1800’s, especially for their landscape beauty, hard wood, and rapid growth. As native hardwoods became more scarce, quick-growing timber for use by the railroad and other buildings were badly needed. Many Blue Gum groves were planted in California for these purposes, but large-scale commercial plantings were useless. The young wood twisted, shrank, and cracked, which made it unsuitable. For the wood to be usable, as in Australia, the wood had to be several decades old. Amazing! I’m surprised not to have heard of such a tree during my three-year stint in Mindanao’s capital city, Davao. I certainly would like to know where in Mindanao I can find it. Thanks. Saw a couple in Hawaii. Nice to learn more about them. I have actually seen these in person on my honeymoon. They look exactly like these pictures. Beautiful! God surely has a paintbrush in His hand!! 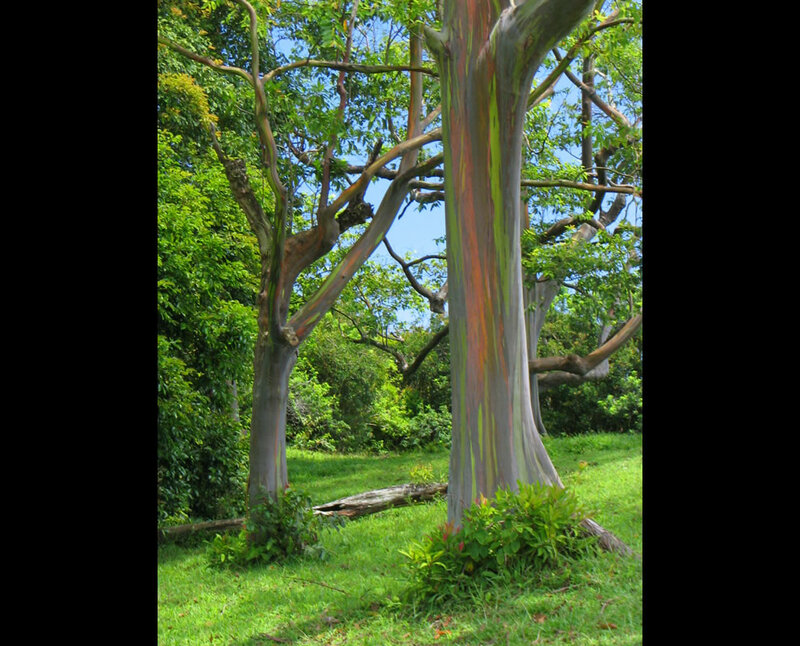 I saw these trees on the hana road when I lived on Maui. Just another reminder why I want to take a long visit back to my other home. The beauty there just makes your hear sing. I never took it for granted for even one day. Wow , these trees are the most beautiful trees I have ever seen . I want one for sure . How can I get it ? 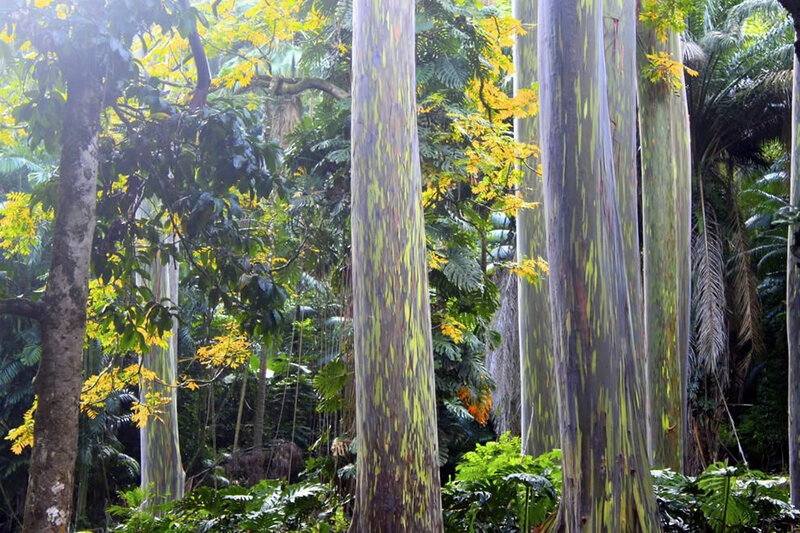 I just love this as most of the trees & plants grown in Hawaii . Absolutely amazing! I never knew these trees even existed! Do they grow anywhere in UK, like in Eden or Kew? would love to see on in real life!! I’ve had the pleasure of seeing this tree before on the Road to Haana, but your photos make them even more facinating and amazingly beautiful. Congruatulations. Great Job in bring out the assets of the tree. 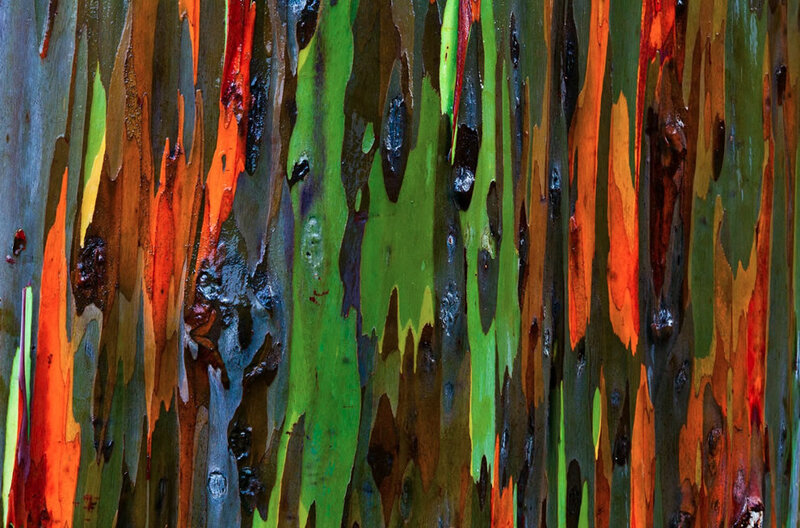 If these pix are not just the deception of digital forgers (a possibility which is tiresomely ever-present these days), I wonder whether any of these gum-bark pigments were investigated by Australian chemists. Some of the pioneering organic chemists who worked out the structures of pigments from flowers were Australian. 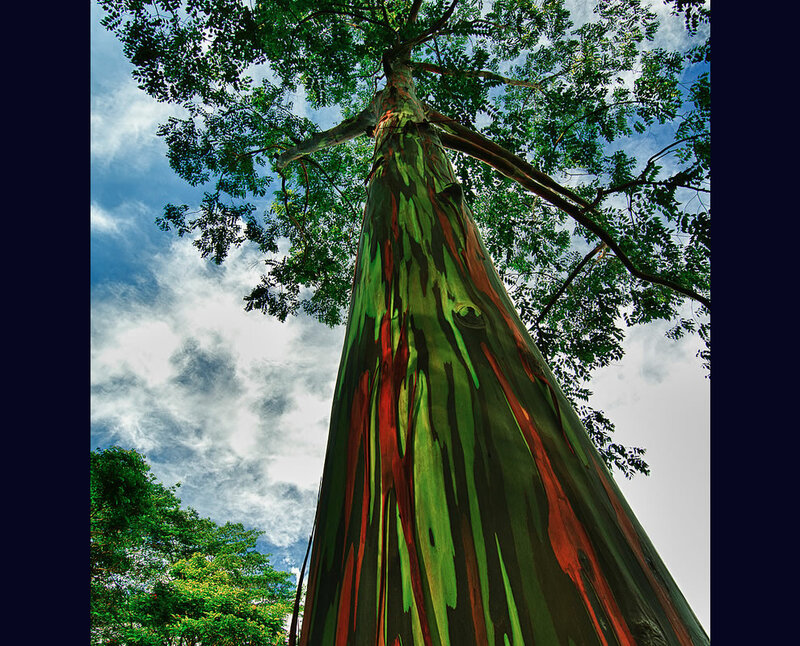 Beautiful pictures, but like most Eucalyptus trees, they create quite a “mess” on the ground under them as their bark sheds. I’m in Awe of the natural beauty that I never inagined existing many thanks for sharing these beautiful/fascinating trees ! It is a True Wonder !!!! I always considered myself a ‘tree hugger’, but this would be my first love, among all existing trees. Surprising that they are not better known. Well, maybe they are but i had never been aware of them. Eucalyptus trees most unique. I think the most beautiful ones are the few that have not been color enhanced. I don’t think the others are pretty at all. They don’t look natural. These photos have not been enhanced. This is truly their actual colors. I live on Maui for 20 years and the Big Island for 12. They actually look like this. I went to high school in Carmel with Amritana and I can vouch for the fact that she did, indeed, live there – actually on some property where these trees grew. nancy, they are not color enhanced and they are natural. this is pure nature, even if you don’t like them. people normally don’t like hyenas either or snakes or spiders either. nature is what it is. Wahl, I never woulda thunk. Absotootly beautimous. Tanx fer de inlitedments. How pretty, they are simpley amazing! Thanks so much for sharing. 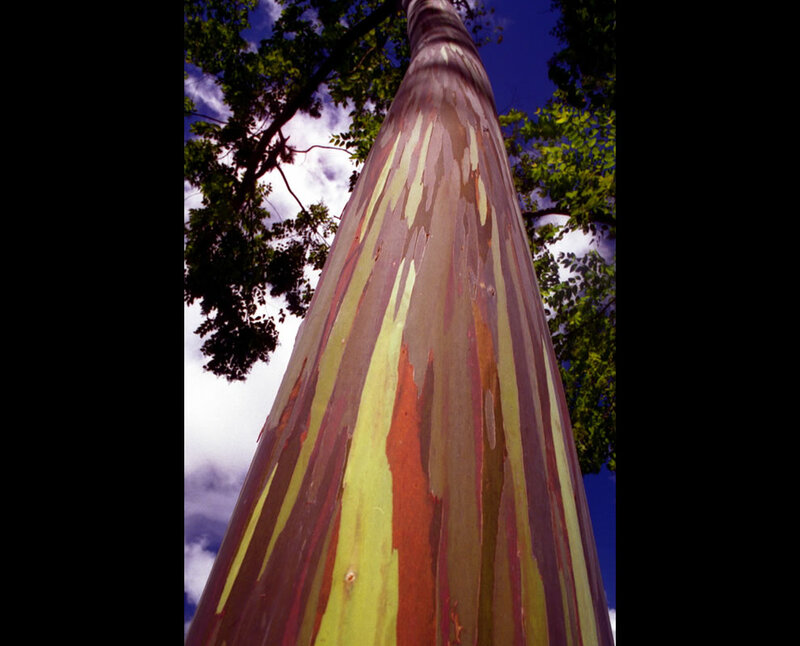 most beautiful and also would be a tree hugger- does it contain any medical use? for cancer and other ? 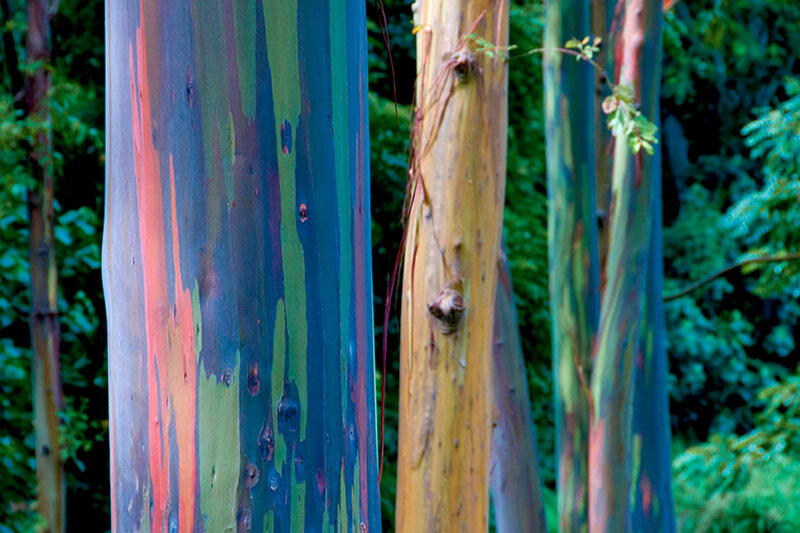 That would be right, the most beautiful eucalyptus in the world – grows outside of Australia! Don’t get me wrong, we have some lovely species, but a forest of these would be spectacular. The fact that their leaves are edible to koalas – is there a possibility that they once may have been indigenous to N.E. Australia, but maybe we logged them out of existence? Thanks for sharing the pictures with us. I didn’t know they exited. Gorgeous. I’m continually amazed by the beauty God has created. Creation is awesome! amen I so believe that !!! God is good!!!! I never even seen a tree like that before, that is truly amazing, our God is so creative! Thank you for sharing. I too, didn’t realize they existed and am truly amazed. Someone wrote that the trees took their breath away—it truly does. I grew up in Hawaii but never knew they grew there on Oahu. I stand amazed in their presence that God would create such beauty and wonder in a tree. Thanking you for introducing me to the wonderful pictures of these trees. I have never heard of them before and am sorry that some Nature books did not publish such sights. Pity we cannot grow them in Scotland – I don’t think they would like the cold! Absolutely gorgeous sight to see! 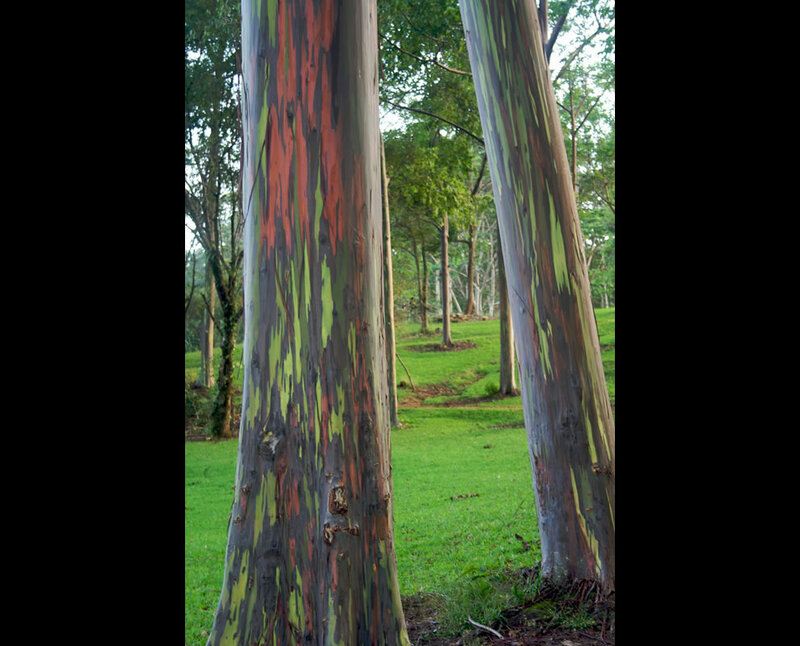 I grew up in West China, where we had lots of eucalyptus trees, but none everr looked like thsse! Thanks for sharing these very fine pictures. I’ve never heard of such. Isn’t nature truly wondrous? I do not live in climate where such a tree would survive or else several would be throughout the property. It is no more than another sign through nature of God’s existence. Thanks for all these wonderful pictures. I help plant trees for future generations, so you know I appreciate your spectacular photographs. Does anyone know what the finished lumber used in cabinet making looks like? Color or grain of this wood? Thanks, Jerry M.
In Wa. State they are called madrona trees . Madrona = Arbutus. Family Ericaceae. 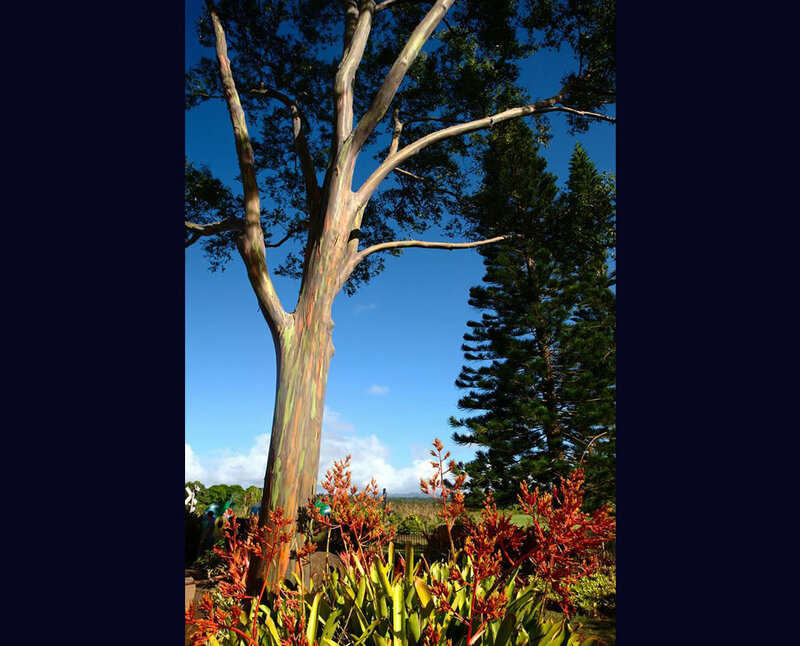 Featured tree is Eucalyptus, Family Myrtaceae. Not related. 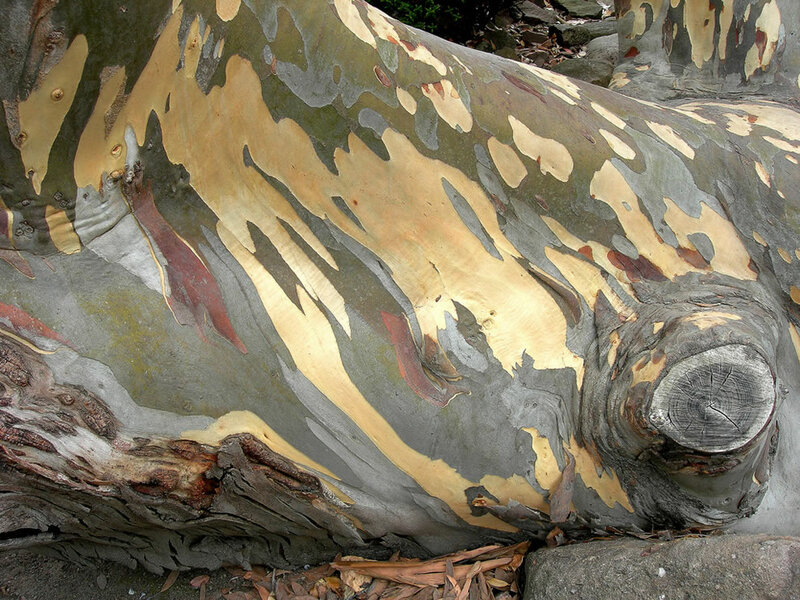 Bark is similar, but Madrona/Arbutus is not nearly so colorful. Many Madrona/Arbutus on mild WA western coastal areas and British Columbia, Canada. I have a beautiful Eucalyptus tree but it has reddish brown bark that our squirrels shred off in strips in the fall to line their nests for winter. Every spring I must clean out all the bird nests and feeders where the squirrels have been cozy over the winter to get them ready for the early birds looking for a nest. My tree is a shoot from the mother tree that froze and burst the trunk in a terrible freeze in 1989. Thinking my tree was lost I cut it down to the ground and this tree is a shoot that grew out of that stump. It is now at least 50 ft tall– wish I had cut it back !!!! It really looks like a hairy brown tree now! Absolutely -beautiful-how could any one ever destroy them-amazing. Who was it that said ” show me” they look to artificial to believ, where is old Harry when you need him. Art is man’s nature; nature is God’s art. Philip James Bailey This is a quote I keep in my art room. PRAISE GOD FOR ALL HIS WONDROUS WORKS ! God’s creation, NATURE, cannot be overdone by anyone or anything. Man cannot equal God in creating beautiful things. Thanks to all the photographers for sharing. They also now grow in Puerto Rico. They were transplanted there around 30 or more years ago. 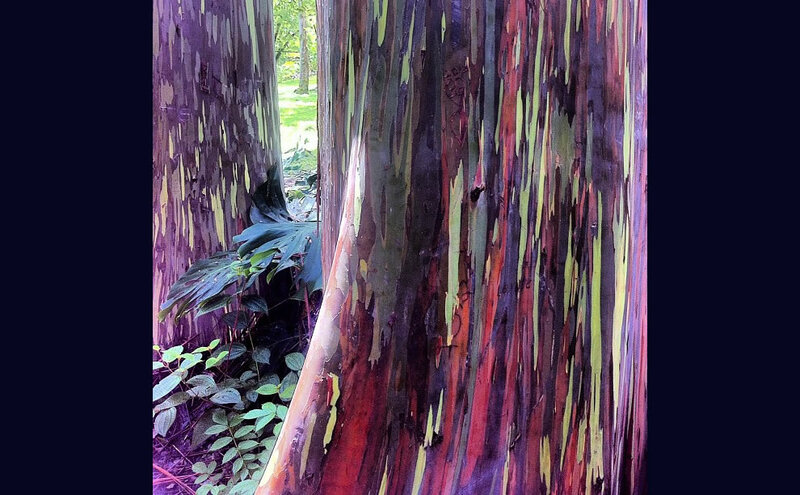 These trees are so beautiful I am wondering if they would grow in the Pacific Northwest. We get enough water but am wondering about the winter. On the western side, not east of the Cascades – too cold here. 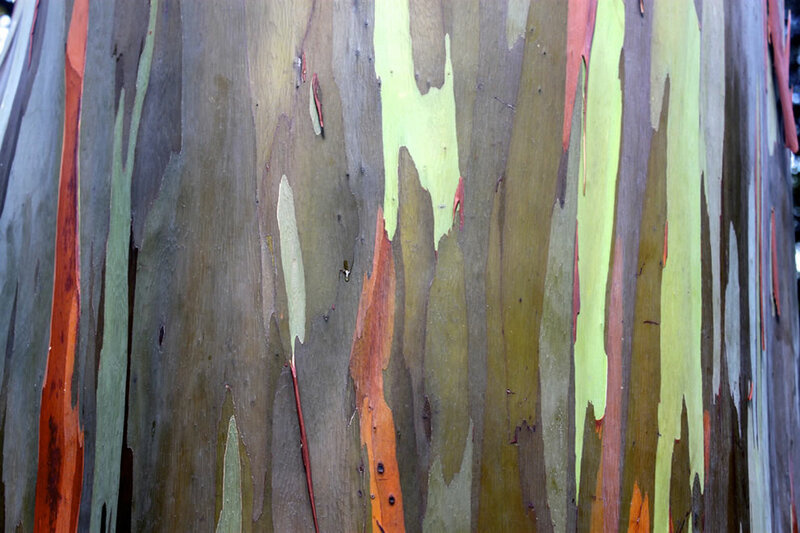 There are several eucalyptus deglupta trees on the UCLA campus. This part of Los Angeles is zone 24 in Sunset rating . They can be found at the north end of campus near the theatre and a few at the south nd of campus. 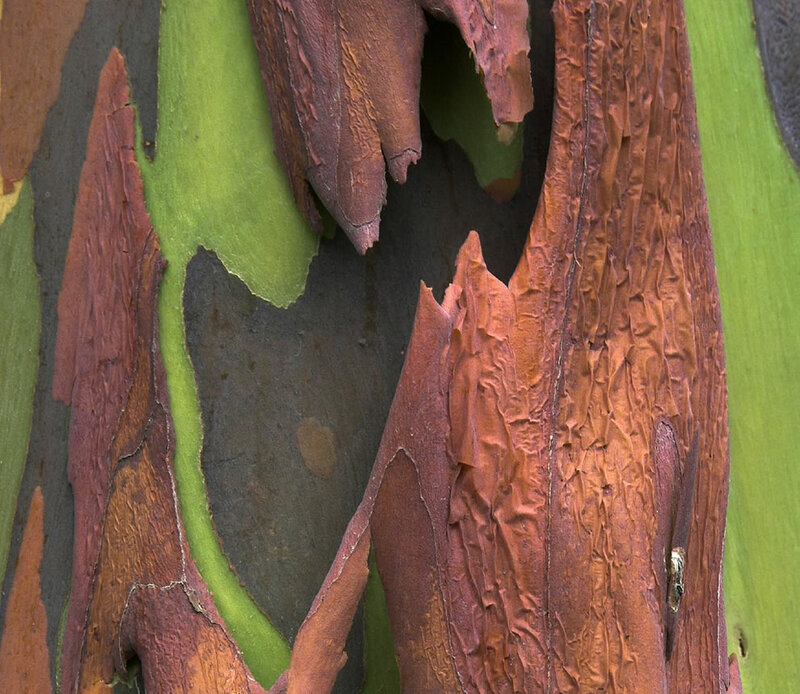 The madrone is a different species called arbutus menzezei. 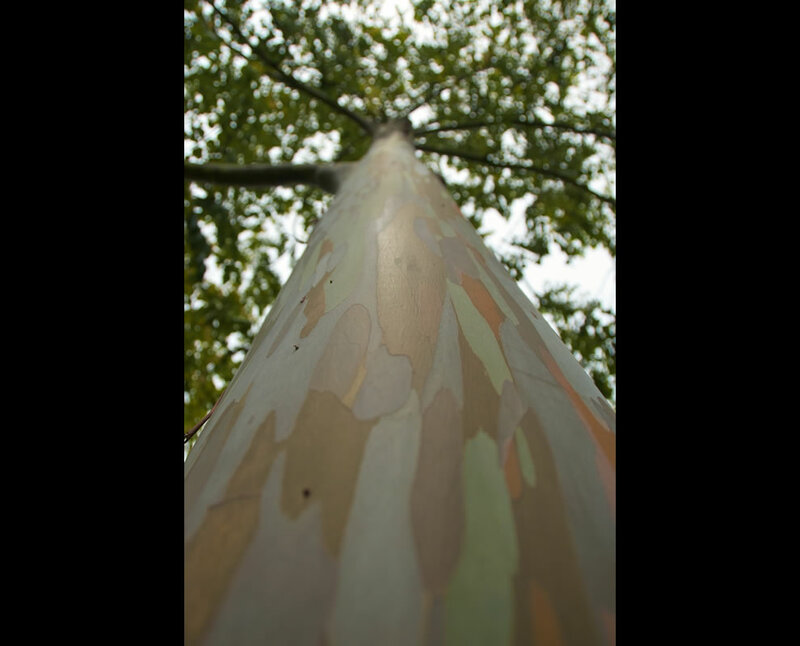 It has a beautiful shiny reddish bark. “Then which of the bounties (of Allah) you twain – O jinn and men — will ye deny! What a beautiful world we live in….. I was a GI for almost 30 years, in WWII, Korea and Viet Nam. 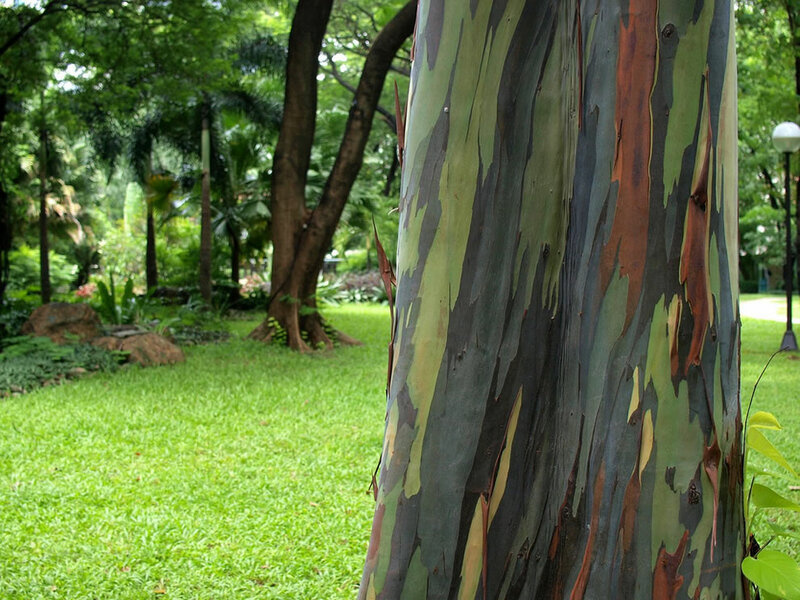 Traveled extensively throughout the South Pacific: Japan, Korea, Taiwan, Philippines, Hawaii, Guam, Solomon Islands and Noumea, New Caledonia but I never saw these beautiful trees. Truly God’s handiwork! How beautiful these trees are. Yes, it’s true the best things in life are free. So appreciate what’s around you!! There is a tree near the entrance of the Honolulu Zoo. Amazing the beauty of Mother Nature!! 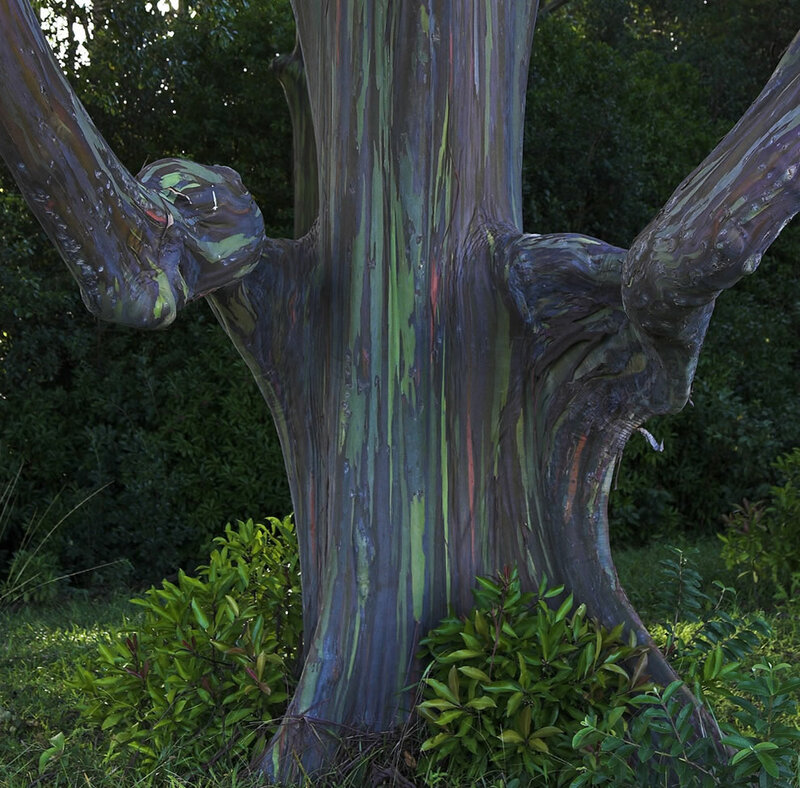 This forester found this beautiful tree at the Fairchild Botanical Garden in Coral Gabels, FL last month. A great place to visit! they are grown in india mostly in dry lands and cut for pulp after 5-6 years. i never thought it has so many shades in its bark. i thank all the photographers for bringing out the shades of germ plasm in the bark. Beautiful tree, but not in my back yard. Messy, dangerous, and burn easily. We have tons of them in the San Francisco Bay Area and they are being taken out when ever possible. Nothing will grow under them either. Leave them in Australia. nah. 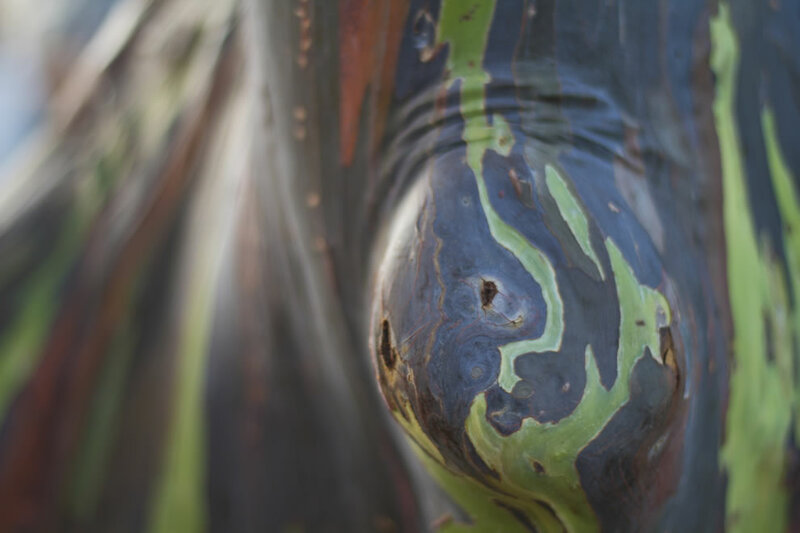 you are confused – we have eucalyptus globulus. by the way – nothing grows under any tree – shade you know. love our sf eucs – leave them alone. Never knew such colors existed. enjoyed the pictures immensely. I would think the colors would come from the different minerals in the soil where they are growing. I know that different types of petrified wood gets their different colors from the minerals through the millions of years of decaying and then solidifying. While serving in the Seabees at subic and manila bays in the phillipines in the early 50’s I never saw any trees like this, We had some mahogany and monkey pod and palms. they must exist in the southern islands. Absolutely Gorgeous, Australia certainly doesn’t anything like those trees. 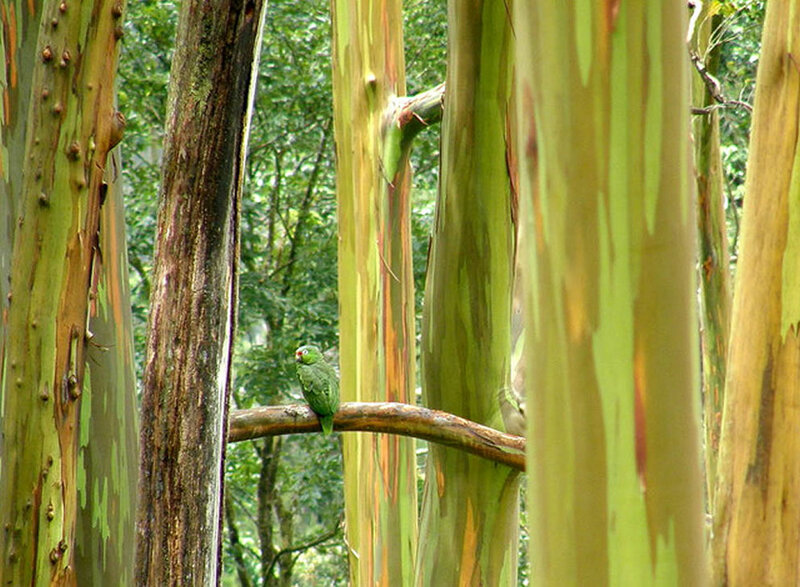 Eucalyptus trees grow also in South Africa, in a temperate and often very dry climate. The colouration is more tawny, creams, browns, and are also very beautiful. 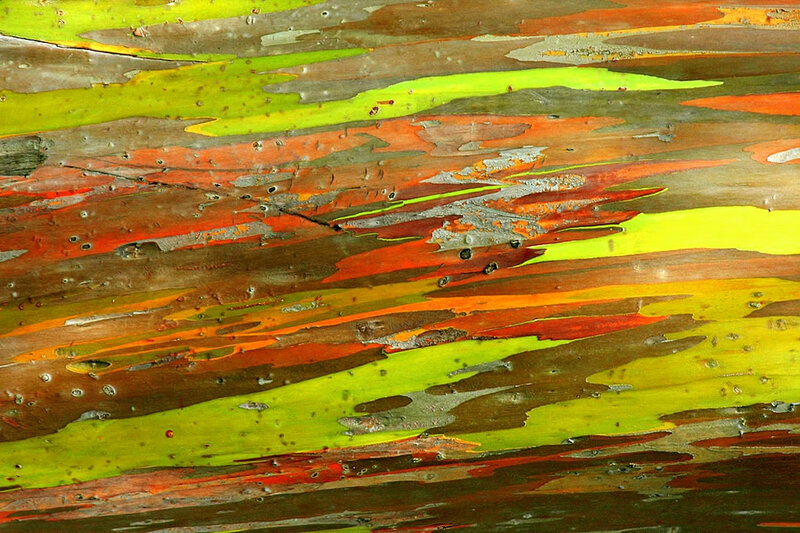 The bark peels off in curls, leaving wonderful abstract designs on the trunk and branches. The conical seeds are often strung into necklaces which hold their pleasantly spicy aroma for many years. I don’t have the words to express how fabulous these trees are. they are absolutely wonderful. almost like a freak of nature. Awesome beauty created by our Creator. Wish I had seen these when we were in Hawaii but never went on any hikes. Unbelievable beauty!! 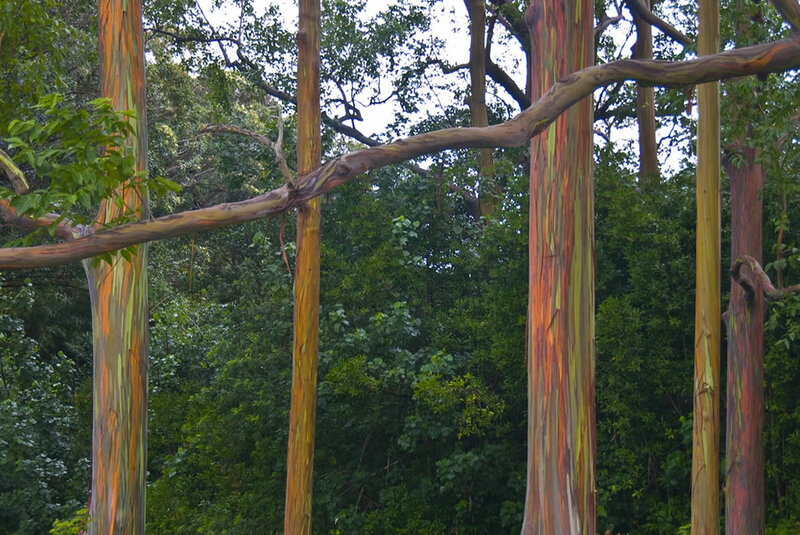 Look for these trees on the Road to Hana on Maui. These are my favorite trees and I only wish I could grow some on the mainland. 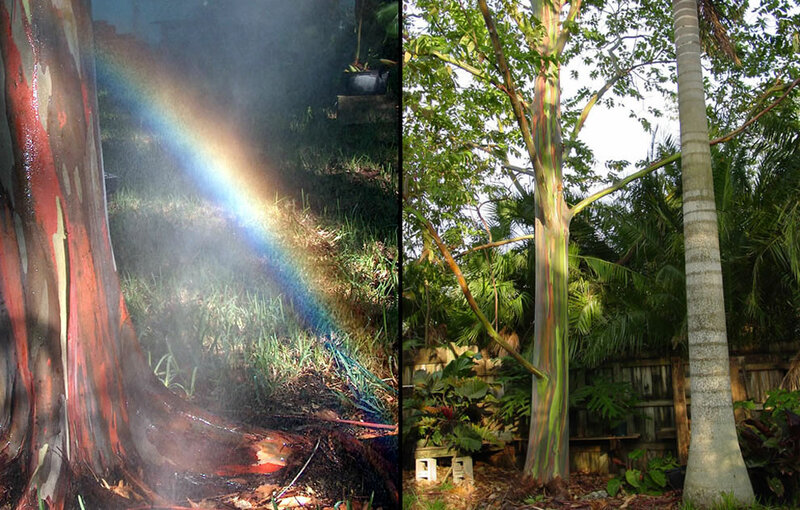 My neighbor has planted a 2 foot rainbow tree. It has grown to be about 5 ft in 3 months. Right now it has clusters of white flowers on the ends of the branches.—Very attractive! Now I understand where the beauty of watercolor paintings come from. Well..For those that have nt already done so, this gives a perfect excuse to take time to visit Hawaii and take in this awe-inspiring site. I look fwd to the day when we can live a long as Almighty God has. After all those wonderful comments I could not possibly find a better way to say how miraculous those trees are!!! Carl & Bess…SuSu & White Paw’s…. Saw them in Australia and in Hawaii, Many in front of the Dole Store in the middle of Oahu. And Allah is the same as God of the Bible. Smartin Up! 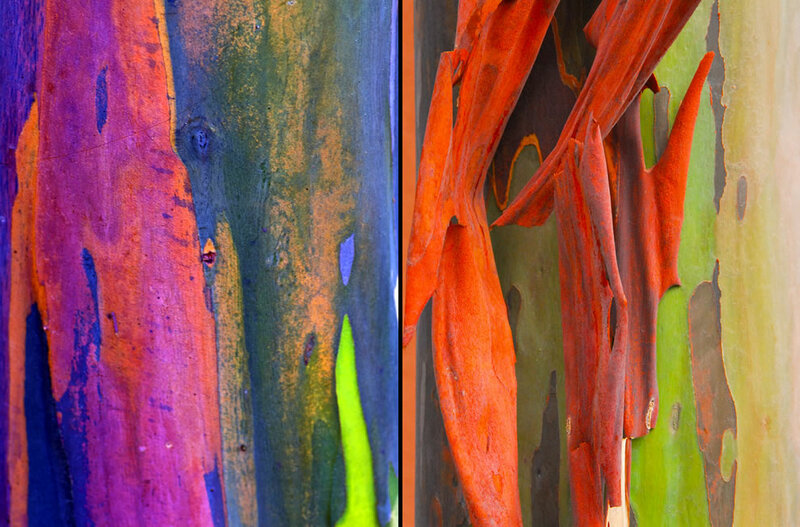 We ran across these on the road to Hana in Maui five years ago and thought them spectacularly and uniquely beautiful. Had no idea then what kind of trees they were. If they grow as much as eight feet in a year and more than 200 feet in height, I wonder how tall they are now. The somewhat small grove on the east side of the road to Hana must be truly awesome today. Does anyone know how long the grove has been there? Amazing colours! 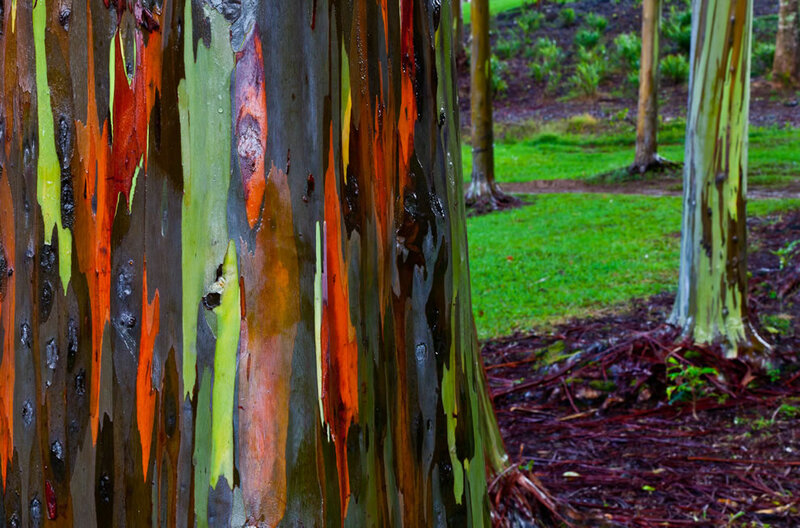 We have some Eucalyptus near our house here in Beechworth, Victoria Australia that change color after it rains but nothing like the Rainbow Tree. I wonder what the significance of this phenomenon is in relation to survival, adaptation, etc in a genetic sense? These are great pics. What a beautiful tree and how nice to see others compliment its creator! 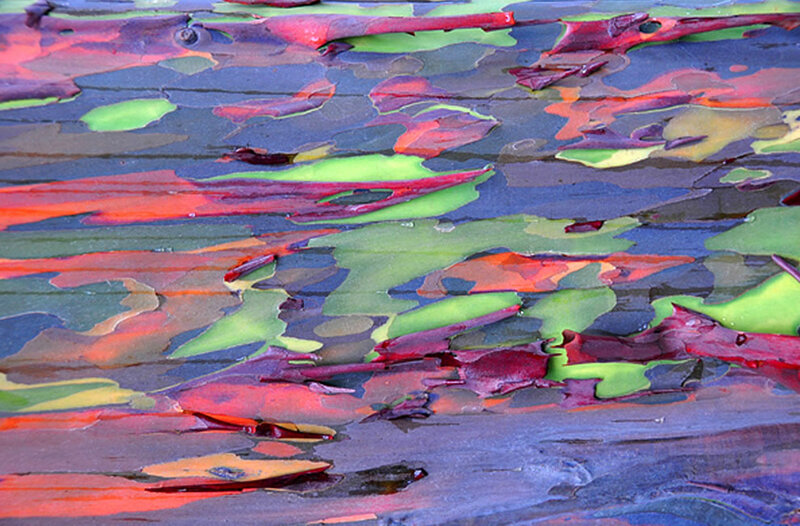 Its only the outside bark that’s colored the wood itself is not as special whish makes it even nicer because it must be alive and growing to appreciate. Their is only one creator and in the Koran where jesus is but a disciple he states HE himself is the chosen one. You cannot argue religion when it is not allowed to question the Koran. There is only one and we all will meet him someday until then lets enjoy and love the gifts he gives in this life!!!! 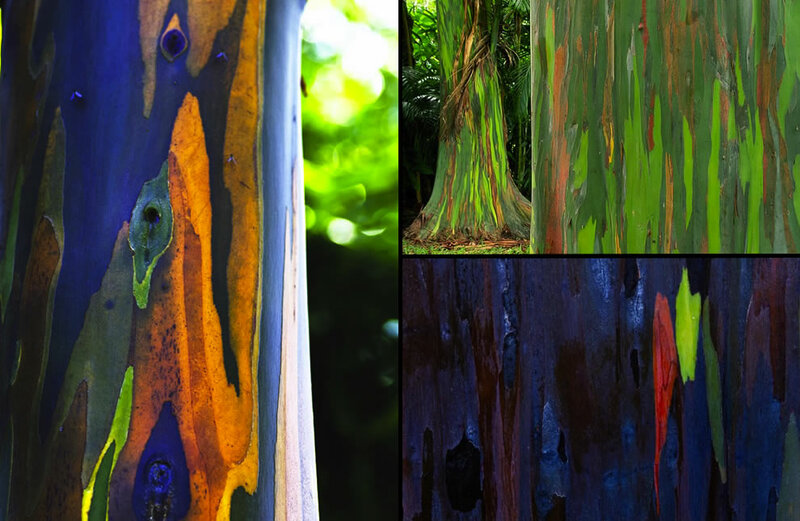 Absolutely the most beautiful and interesting looking trees that I have ever seen in my life. Once again, humans are humbled by nature, when I see these pictures I realize how insignificant we are, even though we don’t think so. Thank you for sharing these with the world.